A Floridian who survived Hurricane Irma said those in the Panhandle are "very shell-shocked and they're just trying to pick up the pieces." 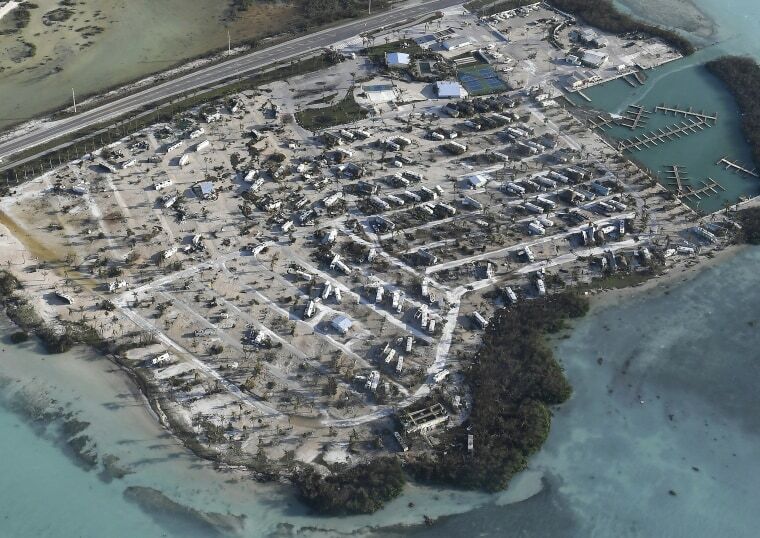 Florida Keys resident Mike Umberg struggled through two chapters of recovery after Hurricane Irma plowed through the chain of coral islands in September 2017 as a fearsome Category 4 storm. First came the fight to regain some semblance of modern life: He waited 10 days before a fuel tanker rolled through his neighborhood to refill his home's generator, three weeks before cellphone service was restored and 30 days before the electricity stayed on for good. When the 56-year-old retired boat captain no longer had to fetch water with a bucket from a nearby canal to flush the toilet, that was hailed as a major milestone. Then there are the difficulties Umberg has endured in the year since: The post-traumatic stress disorder and hospital bills from a water infection. The exterminator cost to get rid of a bat infestation left behind in Irma's wake. And fighting with an insurance company that only offered him $25,000 for a newly-built, $700,000 house that was partially wrecked in the storm. Now, he says he is left with an eerie feeling of anguish after deadly Hurricane Michael leveled whole neighborhoods in the Florida Panhandle this week and left behind a trail of debris and power outages for more than 1 million people across six states. "This was our dream house — we were in paradise," he said said of his Little Torch Key home. "People seem to have forgotten about us." It's a feeling Umberg is worried that people in the Panhandle — from those living in beach communities to rural inland pockets — will begin to experience as they face the headaches of rebuilding and potentially battling with insurance companies. Based on his ongoing experience, he estimates that many will be trying to recover for the next five to seven years. Like the Florida Keys, portions of the Panhandle known as the Emerald Coast — home to warm Gulf waters, sugar white sands and pastel seaside resorts — beckon visitors year-round. Snowbirds from the North have second homes there, and the beaches are popular with people from the South and Midwest. Its recovery will be long. Florida Gov. Rick Scott has described Michael as the most damaging hurricane to hit Florida since Andrew in 1992. "This is the worst from what I've seen in a long shot," he told NBC News on Friday as he toured the devastation. "And if you think about the difference with Irma, water just came in and came out — it didn't move things like this." In Mexico Beach, which took a direct hit from Hurricane Michael on Wednesday afternoon, the loss — of homes, of power, of livelihoods — has stunned those locals audacious enough to ride out such a vicious storm. The idea of recovery and rebuilding feels like a lifetime away for Kelly Jenkins, who is still struggling with the basic necessities. "The main thing is loss of communication. My wife has no idea if I'm OK or not, and there's just no communication," said Jenkins, whose wife had stayed behind at their other home in Albany, Georgia. "I have no idea about the outside world and nobody knows about me." Hundreds of utility workers have been mobilized to restore power as search and rescue efforts continue in northern Florida, Scott said. For those who survived Michael, "it's a little bit of Zombieland. They're very shell-shocked and they're just trying to pick up the pieces," said Cammy Clark, a spokeswoman for Monroe County, where the Keys are located. Clark said she remembers the moment the internet came back on in the Lower Keys after Irma and everyone cheered. There were roadblocks and curfews in place in those early days after the storm, and it took a week for some people to be allowed back home. There were also reports of looting. Even then it was five months before all the debris was cleared from the roads. About 2.2 million cubic yards of storm debris was picked up, enough to fill 650 Olympic-sized swimming pools. One of the biggest problems for homeowners was finding reputable contractors to do work. Older properties had to be rebuilt to newer codes that require homes be elevated above the flood plain. But even local governments have struggled to supply enough inspectors to examine all of the work, Clark said. Then, there is the waiting game for federal assistance and insurance payouts, which continues today. As of Sept. 4, Monroe County has received more than $514 million in federal funding for homeowners, renters and businesses to help in recovery. That includes for grants, flood insurance claims and temporary assistance programs that allow people to remain in their homes. In addition, Monroe County has nearly $40 million in projects seeking Federal Emergency Management Agency reimbursement. As of August, it had received about $2.3 million from the state of the county's FEMA-obligated funds. "A lot of people have just left the Keys if they can't find any other housing because it's really expensive here," Clark said. But one thing that has astonished her is how, at least on the surface, the area has risen from the wreckage of the storm. "Right now if you drive down the Keys, you would think everything looks pretty normal," she said. "Within two weeks, all the trees started growing back, and now it's probably lusher than ever. That's how quickly Mother Nature bounces back."